Probably the most historically significant enemies of Christmas celebrations have been Christian conservatives. Under Oliver Cromwell's rule in England and under Puritan colonists in New England, Christmas celebrations were banned. In England, this briefly caused fans of Christmas, including those more sympathetic to Catholicism and the King, to engage in pro-Christmas rioting. It seems that these rioters were better than average for rioters, as all Wikipedia says about them is that they "decorated doorways with holly and shouted royalist slogans." According to one historian, the modern conception of Christmas as a secularized family-oriented festival of gift-giving was heavily shaped by Charles Dickens in A Christmas Carol. This influential work was adapted into a cartoon by Disney in 1983, leading to Scrooge McDuck's starring role in the DuckTales animated series in 1987, and then the surprisingly awesome DuckTales 8-bit Nintendo game in 1989. 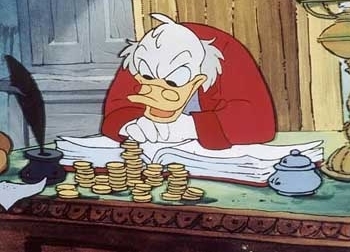 Scrooge was a character from the Disney Comics for several decades before he was put into Mickey's Christmas Carol. His appearance in that film was of a piece with the rest of the Disney characters like Mickey and Donald: preexisting characters "cast" in "A Christmas Carol"
Cromwell wasn't a conservative- he was a man of the Puritan Left, a revolutionary. The conservatives were the royalists and High Church Anglicans. I have no idea what "Christian conservatives" means in this context. As Hector points out, "conservative" is usually associated with the other side of the royalist / Puritan divide. The Puritan position on Christmas actually seems not unreasonable - Christmas is basically a pagan holiday that got absorbed into Christianity. Christmas trees, gift giving, public revelry etc don't seem to have much to do with the Bible or anything else specifically Christian. What conservative means in this context is "People who want to interfere with the kinds of social freedoms John Stuart Mill liked, like the freedom to have a party during Christmas." The Puritans gave uncle Ronnie his favorite "city on a hill" line, too.